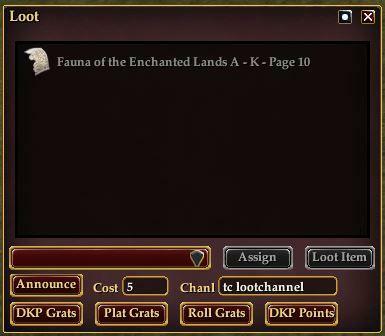 Updated eq2ui_inventory_loot.xml window adds buttons in leader-only loot mode. New buttons allow the raid looter to announce an item for bid, say grats to the winner, and subtract guild points from the winner. The channel for the chat commands is set by the user. 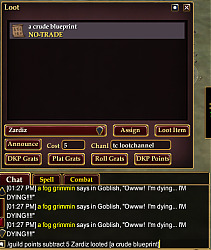 The chat commands are set up to accept an item link at the end. The item link must be supplied by the user by shift-clicking the item icon in the item list. Therefore, the grats and points commands should be issued before the item is assigned (because the item disappears from the list on assignment, and the whole dialog disappears when the last item is assigned). Alternately, the user can shift-click the item for the announcement, then select and copy it in the chat window using Ctrl-C. The item link can then be pasted into the grats and points commands using Ctrl-V.
All the shift-click and copy/paste work is required because there does not seem to be a way to get the item link from within the UI - it must be supplied by user action. * Assign the item to the winner. 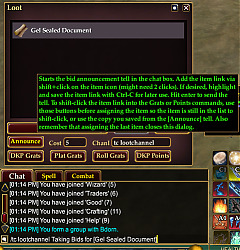 If the custom UI folder does not already have an eq2ui_inventory_loot.xml file, just copy this file into the custom UI folder. 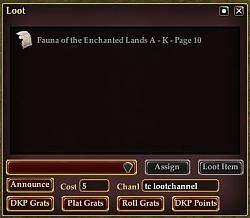 If the custom UI folder contains an eq2ui_inventory_loot.xml file, rename it (for example eq2ui_inventory_loot_orig.xml) and then copy this file to the custom UI folder. 2. If you are not already using a custom UI, you will need to make one, How do I install a custom interface?, then copy this file to the custom UI folder. Thanks to ObsidianDragon for the starting point (which was based on DrumsUI) and DarqUI for how to save settings. Very nice, jeffjl. 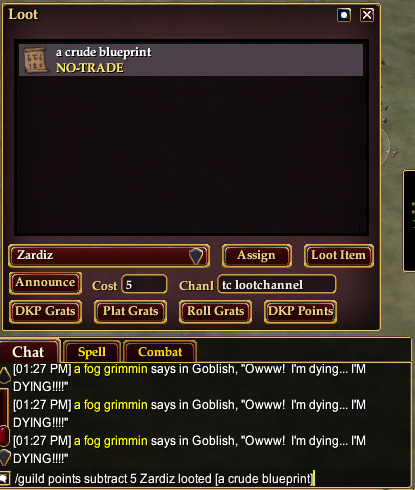 I could never figure out how to get the item link from the table into chat, but using shift+click works great.